From the 17 teams playing at the U16 Division B European Championship in Matosinhos only eight have never played in Division A.
Serbia are playing in this division for the first time while England and Germany return after one year in the elite. With an odd number of teams in the championship, only the top two from each group during the preliminary phase qualify for the quarter-final round and a chance to play for promotion. For the rest of the the teams, they play in the 9th - 17th place classification competition. Serbia start the competition as favourites. But on the first day other teams showed a little of their promotion credentials. Germany and Portugal came away with impressive victories while the other promotion candidates Poland and England huffed and puffed. In Group A, Switzerland powered their victory against Norway (72-25). The contest was over by half time (45-11). In the other game Serbia, one of the favourites for promotion, got their competition off to a good start with a comfortable victory against Ukraine (72-41). Marija Stojiljkovic with 13 points led the offense for Serbia and was joined by Aleksandra Katanic in double digits with 11 points. 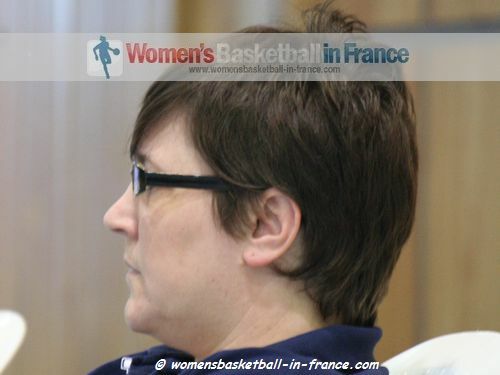 In Group B, Karen Burton (in picture), the coach from England, had something to smile about after finishing 0-9 in in 2012 in Division A, with a (58-55) victory over Romania. Shanice Norton put England in front for good with 90 seconds to play while Jessica Davis iced the victory with a pair of free throws with five seconds to play. Luxembourg saw off Finland in a nail biting finish (48-45). When Lisa Jablonowski scored with 12 seconds remaining to play she gave her team a little breathing space. This was a match in which the teams shared 67 turnovers. When Finland turned the ball over again, they lost the chance of forcing overtime. Germany were too strong for Ireland in every aspect of the game and won their Group C encounter (88-38). 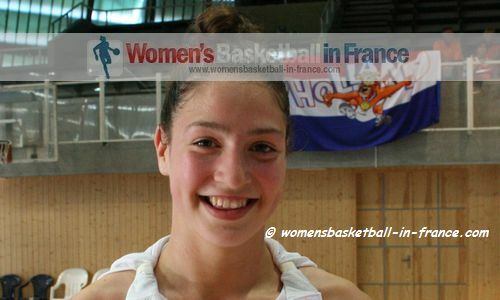 Patricia Broßmann (in picture) only played for 18 minutes for Germany but she finished with a game high 21 points. The hosts Portugal also had a comfortable victory in their opening European Championship game. Denmark suffered a 22-0 reversal during the final quarter as the hosts cruised to a (83-35) victory. Maria Kostourkova finished with 30 points and 15 rebounds. In Group D, another of the tournament's favourites Poland avoided defeat by beating Estonia (55-43). However it was not a solid performance from the victors taking 25 shots more than their opponents. Israel were thankful for 13 missed free throws by Slovenia as they held on to win (59-53).